Left penniless and homeless, Beckham socialite Melanie Rutherford sees no other option but to become a mail order bride. Luckily, a wealthy rancher in Colorado needs a wife, and although sheâ€™s not entirely thrilled with the idea of going west, at least sheâ€™ll be able to live the lifestyle sheâ€™s accustomed to. However, when she arrives in Cedar Valley, Colorado, she learns that her betrothed has married someone else. When Tom Harperâ€™s brother, Earl, elopes with his childhood sweetheart, Tom is elected to break the news to the mail order bride he was supposed to marry. Tom has no intention of getting married, yet something about the woman who arrives on the stage makes his brain shut down and he finds himself offering to take his brotherâ€™s place. With nowhere to go and no way to get back to Beckham, she accepts Tom’s proposal, only to discover that Earl had lied about many things â€“ including the fact that he wasnâ€™t the wealthy rancher she expected, but that he and his family owned a â€¦ farm! And sheâ€™d be expected to work! Can a woman who only knows how to host dinner parties and attend the opera ever become a real farmerâ€™s wife? And can a man who didnâ€™t want a wife ever become a real husband? Will Melanie and Tom be able to put their differences aside and allow themselves to acknowledge the feelings developing between them and have a real marriage? 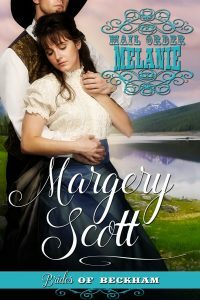 Â Â Â Â Â â€œYou canâ€™t do this to me.â€ Melanie Rutherfordâ€™s voice rose to a squeaky tone the way it always did when she was frustrated, angry, or just plain upset. It irritated her that she had no control over it. After all, just because her life was falling apart around her, a lady of her breeding shouldnâ€™t sound like a fishwife. Â Â Â Â Â â€œSurely I canâ€™t be held responsible for my brotherâ€™s â€¦ my half-brotherâ€™s debts â€¦â€ Her voice trailed off, and her temper rose another few notches. Â Â Â Â Â Melanie cut him off with a bitter laugh. â€œYouâ€™re too kind,â€ she said tersely. â€œYou mean his desertion â€¦ his abandonment â€¦ his disappearance â€¦ Stop me when I have the correct term.â€ At first, sheâ€™d refused to believe Martin had actually emptied their fatherâ€™s accounts and left town without a word, but as time went on, sheâ€™d had no choice but to accept the fact that he had no intention of coming back and returning any of the money. Â Â Â Â Â â€œAny of the above will suffice,â€ he said quietly. Â Â Â Â Â â€œNow what was it you wanted to say?â€ Melanie asked. Â Â Â Â Â Melanie wanted to scream at the unfairness of everything that had happened over the past few months. First, her father had died unexpectedly, then her half-brother had absconded along with every cent in the familyâ€™s accounts at the bank, and now she was going to be evicted from the only home sheâ€™d ever known. Â Â Â Â Â She slowly let her gaze drift around the mansionâ€™s opulent drawing room. Valuable ornaments graced the mantel above the marble fireplace and the side tables. Thick patterned rugs imported from the Orient covered the ebony floors, and gilt-framed paintings created by some of the worldâ€™s most renowned artists hung on the walls. Â Â Â Â Â Mr. McIntosh stood up. He was barely Melanieâ€™s height, and in the candlelight she couldnâ€™t help noticing the shiny bald spot on the crown of his head. Well, she thought snidely, she might not have any money and sheâ€™d be living on the street, but she at least still had her hair. Â Â Â Â Â Without another glance behind him, he opened the door and walked out. Â Â Â Â Â Melanie watched the door click shut behind him, then sank into the brocade armchair beside the fireplace. The Louis XIV clock that stood in the corner of the room chimed. Â Â Â Â Â The sound reminded her of a death knell. Which it was, she realized. Death of life as she knew it. Â Â Â Â Â She let out a harsh laugh that soon evolved into a strangled sob. Â Â Â Â Â Her mind spun. Anger, sorrow and fear whirled through her brain until she felt dizzy from it. She leaned back and closed her eyes. What was she going to do?